CAMBRIDGE, UK - March 13, 2012- ARM today announced the ARM® Cortex™-M0+ processor, the world's most energy-efficient microprocessor. The Cortex-M0+ processor has been optimized to deliver ultra low-power, low-cost MCUs for intelligent sensors and smart control systems in a broad range of applications including home appliances, white goods, medical monitoring, metering, lighting and power and motor control devices. The 32-bit Cortex-M0+ processor, the latest addition to the ARM Cortex processor family, consumes just 9µA/MHz on a low-cost 90nm LP process, around one third of the energy of any 8- or 16-bit processor available today, while delivering significantly higher performance. This industry-leading combination of low power and high performance provides users of legacy 8- and 16-bit architectures with an ideal opportunity to migrate to 32-bit devices, thereby delivering increased intelligence to everyday devices, without sacrificing power consumption or area. The Cortex-M0+ processor features enable the creation of smart, low-power, microcontrollers to provide efficient communication, management and maintenance across a multitude of wirelessly connected devices, a concept known as the 'Internet of Things'. This low power connectivity has the potential to enable a range of energy-saving and life-enhancing applications from sensors to wirelessly analyze the performance and control of domestic or industrial buildings, to battery-operated body sensors wirelessly connected to health monitoring equipment. Current 8-bit and 16-bit MCUs lack the intelligence and functionality to deliver these applications. "The Internet of Things will change the world as we know it, improving energy efficiency, safety, and convenience," said Tom R. Halfhill, a senior analyst with The Linley Group and senior editor of Microprocessor Report. "Ubiquitous network connectivity is useful for almost everything - from adaptive room lighting and online video gaming to smart sensors and motor control. But it requires extremely low-cost, low-power processors that still can deliver good performance. The ARM Cortex-M0+ processor brings 32-bit horsepower to flyweight chips, and it will be suitable for a broad range of industrial and consumer applications." The new processor builds on the successful low-power and silicon-proven Cortex-M0 processor which has been licensed more than 50 times by leading silicon vendors, and has been redesigned from the ground up to add a number of significant new features. These include single-cycle IO to speed access to GPIO and peripherals, improved debug and trace capability and a 2-stage pipeline to reduce the number of cycles per instruction (CPI) and improve Flash accesses, further reducing power consumption. The Cortex-M0+ processor takes advantage of the same easy-to-use, C friendly programmer's model, and is binary compatible with existing Cortex-M0 processor tools and RTOS. Along with all Cortex-M series processors it enjoys full support from the ARM Cortex-M ecosystem and software compatibility enables simple migration to the higher-performance Cortex-M3 and Cortex-M4 processors. 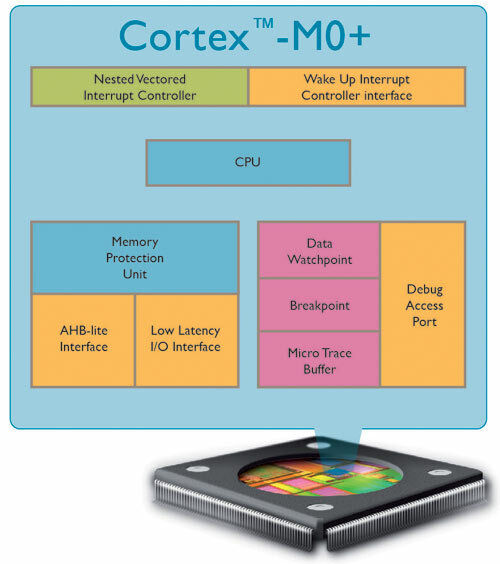 Early licensees of the Cortex-M0+ processor include Freescale and NXP Semiconductor. "We're excited to further strengthen our relationship with ARM as a lead partner in the definition, and first licensee of the smallest, lowest-power ARM Cortex-M series processor yet," said Dr. Reza Kazerounian, senior vice president and general manager of Freescale's Automotive, Industrial & Multi-Market Solutions group. "The addition of products built on the Cortex M0+ processor will make our fast-growing Kinetis MCU line one of the industry's most scalable portfolios based on the ARM Cortex architecture. With the ability to reuse code, higher performance and improved energy efficiency, the Cortex M0+ processor will enable designers to transition from legacy 8-bit and 16-bit proprietary architectures to our new Kinetis devices, without sacrificing cost and ease of use benefits." "NXP is the only MCU vendor to have adopted the complete ARM Cortex-M processor series, and we're excited to be able to add the Cortex-M0+ processor to our portfolio," said Alexander Everke, Executive Vice President and General Manager of High-Performance Mixed-Signal businesses, NXP Semiconductors. "We have already proven the success of our Cortex-M0 processor portfolio with over 70 part types shipping in high volume today, this new Cortex-M0+ processor further accelerates our momentum into the 8/16-bit market." "The Cortex-M0+ processor is yet another demonstration of ARM low power leadership and its commitment to drive the industry forward towards ever lower power consumption," said Mike Inglis, EVP and GM, Processor Divison, ARM. "With our expertise in low-power technology, we have worked closely with our Partners on the definition of the new processor to ensure that it can enable the low-cost devices of today, while also unlocking the potential benefits delivered by the Internet of Things." The Cortex-M0+ processor is ideally suited for implementation with the Artisan® 7-track SC7 Ultra High Density Standard Cell Library and Power Management Kit (PMK) to fully capitalize on the ground-breaking low power features of the processor. The Cortex-M0+ processor is fully supported from launch by the ARM Keil™ Microcontroller Development Kit, which integrates the ARM compilation tools with the Keil µVision IDE and debugger. Widely acknowledged as the world's most popular development environment for microcontrollers, MDK together with the ULINK family of debug adapters now supports the new trace features available in the Cortex-M0+ processor. By utilizing these tools, ARM Partners can take advantage of a tightly coupled application development environment to rapidly realize the performance and ultra low-power features of the Cortex-M0+ processor. The processor is also supported by third-party tool and RTOS vendors including CodeSourcery, Code Red, Express Logic, IAR Systems, Mentor Graphics, Micrium and SEGGER. This new Pogoplug Mobile is designed to be cheaper, with just 1 USB host connector, 1 SD card slot, one Ethernet port and the power charger. The idea is that you connect this at your house, with a 2TB external hard drive or whatever other storage you want, and you can then stream it to your smartphone, tablet, laptop wherever else you are in the world. There is also a hacking community at http://pogoplugged.com that may do things like BitTorrent RSS downloads work on this device. This device may still have about the same performance using the same Marvell processor as the previous Pogoplug, but that is to be confirmed. Please post in the comments if you know anything more about the actual performance of this processor to download from BitTorrent RSS, stream HD video files over the local network and other of the processor intensive tasks that can be envisionned from such Internet connected NAS system. Tudor Brown, President of ARM, delivers a keynote speech on the status of the ARM industry and where it's headed. Here at the Computex 2011 trade show in Taipei Taiwan, look forward to a whole bunch of new ARM Powered devices. As 25 Billion ARM processors have been shipped thus far, look forward to even more uses for these ARM Processors, with the Internet of Things and infinite other uses to turn everything smart. Android@Home enables the Internet of Things. 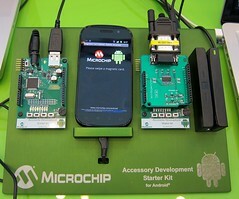 The biggest announcement at Google I/O was the launch of the Android@Home Open Accessory Development platform. This is the platform for a whole new world of accessories and connecting everything through Android to the Internet. Suddenly, we are smart about all things and all things become smart. Now we are not only talking about about connecting 7 Billion people to the Internet with Android Smartphones, now it becomes about connecting 100 Billion things through Android to the Internet. Why the Internet of things? Why using Android? The cost to add an ARM processor such as one of the ARM Cortex-M series, with sensors, switches and wireless connectivity in every appliance in your home may cost as little as few cents or a few dollars per device. It's so cheap that as soon as an open standard is established and as soon as applications are planned out, all devices will get connected with this technology. Watch my video with Nuvotron NuMicro at Embedded World 2011 about the cost ($0.50-$2) and use of ARM Cortex-M0 32bit microcontrollers in all types of devices. - Put a smart control in every lamp and the lights follow you, if you move to another room the lights automatically turn off, you save power. They automatically dim if they detect you're relaxing or watching TV. - Put a smart control in all your doors, in all your windows, in all your power outlets, integrated with your heating systems, water systems. - Add sensors, ARM Processors in your pillow, blanket and in your bed, to monitor your sleep and wake you up at the right time between the right sleeping cycles. You'll feel better the whole day and you'll optimize your sleeping times. It's more healthy, makes you more productive and saves you time. The trick is that even as the Internet of things has been possible for a while, and even as prices to add smart controllers and sensors in each thing costs $3, people haven't been doing much of it yet just because the control, management, interactivity systems around this have not been standardized and open yet. If you want to build the Internet of things it has to be built around you and for you and not among each thing and only for each thing. That is why Android is your interface into that world of things, and Google supports the open Adruino platform to enable these developments in an open industry. Android is the UI for the Internet of Things. Android is how you guide it, how you see it, it's how you control your things. 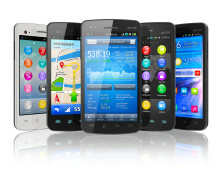 Expect the next consumer electronics trade shows to showcase more and more ARM Powered things to connect with the Android ecosystem, look forward to an industry about to get really creative in how to use and feature that Internet of Things most efficiently.